You know the most creative way to procrastinate over your long-run project (BYTE, in our case)? Of course, a gamejam! And then another one! And then..! Don’t worry, no one will blame you, because technically you are doing an important job – farming new experience in short terms, improving your gamedev skills and adding new ones. So yeah, we did it again. A quite some time ago, actually: Kanobu GamesJam2017 was running from mid-March to mid-April. The theme was as dumb as usual and sounded like “No survive without physics”. Not everyone were happy to participate in second jam in a row, but I was like: “c’mon guys, this is the best chance to show off our mad skillz and even win some prizes!” Well… no prizes for us this time. After all that frustration with selecting a proper concept for the game, repeating a mantra-like “let’s make a simple game, let’s make a simple game, BIATCH!”, we’ve decided to do the most unsuitable concept for the gamejam terms – “physic-based metroidovania-bossfight in pixelart with dynamic lighting”. But hey! At least that sounds cool. An important note – all our artists were busy, so the whole art was up to us. As if we know how to draw, even in pixel art… Nevertheless, everyone did their best: Stranger made an amazing foreground objects with animations, Nick was in charge of drawing and animating main hero (her name is Alice, by the way), Roller dug into particles and FXes, while I was drawing the most boring stuff, like backgrounds, crates and barrels. The real deal that helped us a lot was a SpriteLamp. 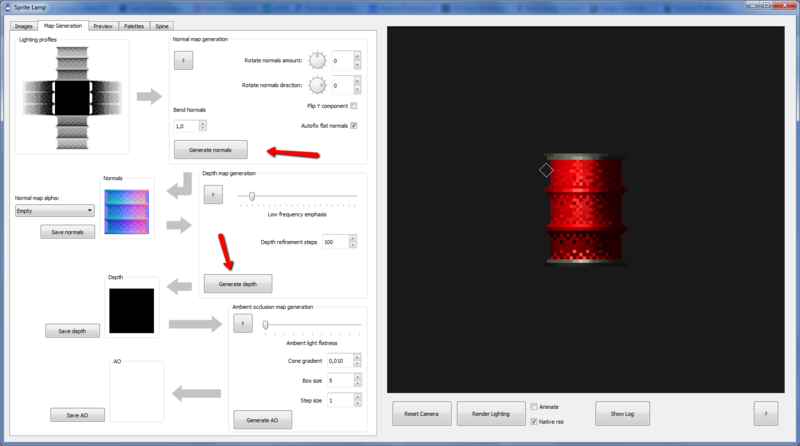 A little neat tool for making normal maps for sprites. Of course, there was a price – every sprite that needs a dynamic shadows, we had to drawn 5 times: a diffuse and 4 shadow maps, for various light position (left, right, above, below). But the results were stunning even in non-artists hands. You may guess “okay with art, but what about the game?” The problem is, we thought that way too. We were too busy and, perhaps, too happy with our brand new artist skills, so we completely forgot about gameplay. It must be a “something went wrong on space station” kind of story, with eerie, dark atmosphere. 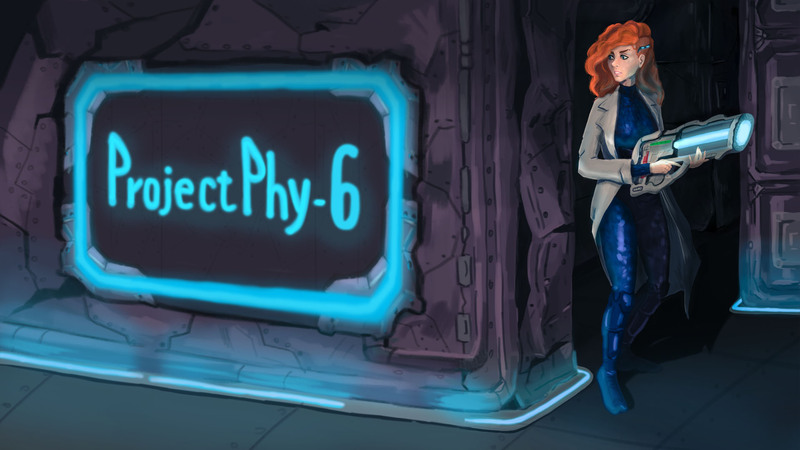 Alice, our protagonist and one of the survivor on board, equipped with our version of gravity gun (called “Phy-6”. Genius, eh? ), had to wander around in search of others, using her gun for reaching places. For example, you can pull and hang on anything with tractor beam, or push objects (or even yourself in mid-air) with gravity push. And the bosses, yeah. Well, without “es”. The only one boss was made, and it was totally unplayable – at least because of “infinite HP” bug, that might not be fixed even now. The whole concept of throwing crates and stuff in big badass-something as a replacement of a real weapon, turned out to be a very doubtful thing, to say the least. Not like in Half-Life 2, not at all. All this mistakes are natural for the last 2-weeks crunch before the deadline. But it was…well, fun, in some way. In the end, “Project Phy-6” got listed by the jurors in “Best 25 games of the Jam” (out of ~160), but that’s it. Not bad, I presume. For those who brave enough to play in it, here is the last build of Project Phy-6. And here’s our KanobuGamesJam-page (in russian, obviously). P.S. Very big special thanks to DNK’s little sister, Daria Sukhorukova – for excellent cover art!